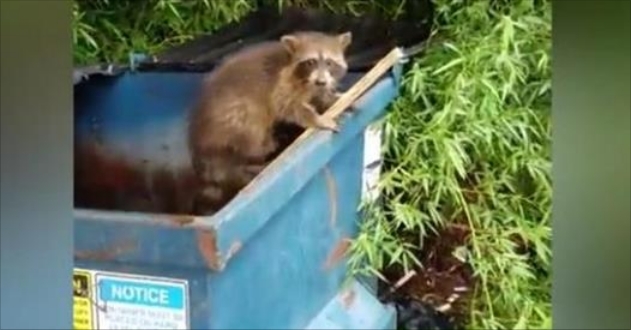 A New York man who filmed his wooden-plank rescue of three dumpster-stranded raccoons said one of the animals appeared to give him a "nod" of respect. The Wawarsing man said he pulled into his driveway Friday after working a night shift as a trauma tech at a local emergency room when he heard the sounds of animals trapped inside his dumpster. "I knew it was probably raccoons who got stuck in there during the night, so I got a board to [help] them out," the man wrote. The first raccoon to exit the dumpster turns to face the man and appears to give him a respectful silent greeting. "The first one who exits actually nods at me almost like he is saying thank you," the filmer wrote. This video definitely has an amusing and light tone to it, but it still has an important underlying message: we can all learn how to coexist with the wildlife a little bit better. Responses to "Raccoon gives man a 'nod' as 'thank you' for dumpster rescue"